When will be My Kitchen Rules next episode air date? Is My Kitchen Rules renewed or cancelled? Where to countdown My Kitchen Rules air dates? 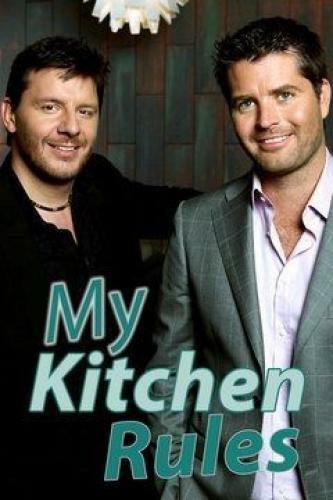 Is My Kitchen Rules worth watching? Let the food fight begin! MY KITCHEN RULES is an unscripted cooking series that pits celebrity duos against each other as they cook and critique each other's food. The teams will take turns hosting intimate dinner parties in Hollywood homes, with a menu designed to impress their rival competitors and two professional chef judges, Curtis Stone ("Top Chef Masters") and Cat Cora ("Iron Chef America").The eight-episode series features big dishes and even bigger personalities with celebrity duos, including TV host and *NSYNC member Lance Bass with his mother, Diane Bass; Grammy Award winner Brandy and her brother, R&B recording artist Ray J; comedian Andrew Dice Clay and his wife, Valerie Vasquez; reality TV star Brandi Glanville and her friend, Dean Sheremet; and country superstar Naomi Judd and her husband, Larry Strickland.With escalating rounds of competition, the celebrity duo with the lowest score at the end of each round will be eliminated. The last two pairs standing will battle it out in the final round for a pressure-cooker evening during which they will prepare and present their ultimate dining menu. In the end, only one team will survive the drama and earn the right to claim MY KITCHEN RULES. The party is about to get wild as special guest Kelly Osbourne and her friends host the next dinner party. Lance and Diane go head-to-head against Dice and Val, as they take turns cooking in the same kitchen. But instead of letting the competition get the best of them, the teams strategize on how to work together in order to stay in the competition. At the end of the night, the duos wonder if their efforts will pay off as another team is eliminated from the competition. After the last elimination, the final three teams are feeling more competitive than ever! Their next dinner party is unlike any other, as each team is tasked with cooking for a crowd of more than 100 people at an exclusive art gallery showing. Actress Leah Remini makes an appearance and helps narrow down the competition as a special guest judge. Find out with team comes out on top. The teams must create tasty tailgate food for the Los Angeles Rams and their fans; Rams players Issac Bruce, Cameron Lynch and Johnny Hekker and Rams cheerleader Andy Riggs help Curtis and Cat make their final decision on which duo to eliminate. Mother-son duo Lance and Diane face off against Andrew Dice Clay and wife Valerie, as they prepare a four-course meal for a panel of six chefs and the former contestants. My Kitchen Rules next episode air date provides TVMaze for you. EpisoDate.com is your TV show guide to Countdown My Kitchen Rules Episode Air Dates and to stay in touch with My Kitchen Rules next episode Air Date and your others favorite TV Shows. Add the shows you like to a "Watchlist" and let the site take it from there.